Give the Gift of Health this Holiday Season | AIS, Inc. The holiday season is a magical time full of cheer, happiness, and joy. It can also be riddled with stress, lack of sleep and lots of unhealthy (yet delicious) foods. Finding the right balance to stay healthy while enjoying all the holidays have to offer can be challenging. The good news is that this is also the season of giving. 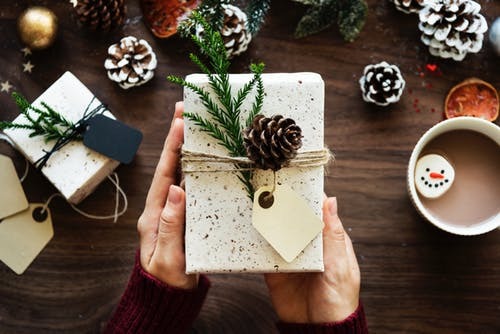 While holiday shopping can add stress to your life, giving thoughtful, health conscious gifts to your loved ones can help them survive the season, and you feel wonderful about helping them feel better. Relaxation: Help your friends and family relax and destress during this busy time of year with soothing gifts that will pamper them. A “Relax” gift basket filled with bath essentials may encourage them to carve out some downtime. Fill their basket with Epsom salts, bath oils, candles, a bath pillow or luxurious towels. A plush robe or soft slippers are also great additions. Other relaxing gift ideas could include a spa gift card or an hour-long massage. A beautiful diffuser with essential oils is another excellent way to help them relax any day. Nutrition: Staying on track nutritionally can be very difficult this time of year. Help your friends with gifts that keep them on track. A new recipe book or a cooking magazine subscription will help them find new ways to eat healthily. The gift of a meal plan membership is a great idea too. They will receive pre-measured supplies to cook healthy meals right at home. Exercise: Help your loved ones with a gift of health and exercise. A work-out DVD, stretching equipment or weights for lifting will keep them moving. Sign your friends up for an exercise class, maybe one you can take together. A trial gym membership is a great way to get them started down the path to good health and to jump-start their New Year’s Resolution. Often what brings others the most joy is spending time together, with you. Instead of getting everyone on your list physical presents, consider the gift of an experience. A restaurant or movie gift card, tickets to a concert or a fun local event, or even a planned weekend road trip with you will be a welcome gift that will create memories to treasure. When thinking about the gifts you want to buy this holiday season, keep health in mind and think outside the box. Your loved ones will thank you, and you will feel great knowing you gave them something they will truly treasure. May your holidays be happy, and your gift giving be healthy the wonderful season!